After the wort is cooled and aerated, the yeast culture is, at last, added to the wort, in a step called pitching. Brewing yeast strains are dramatically different from the Saccharomyces cerevisiae strains used in the laboratory in many important respects (Box 9-5). In addition, there are two types or strains of brewing yeasts that are used, depending on the type of beer being produced, and these strains also differ physiologically, biochemically, and genetically. Many of these differences are highly relevant to the beer fermentation (Table 9-4). Specifically, ale beers are made using selected strains of Saccharomyces cerevisiae, otherwise known as the "ale" or "top-fermenting" yeast. Lager beers are fermented by Saccharomyces pastorianus (formerly called Saccharomyces carlsbergensis), also known as the "lager" or "bottom-fermenting" yeast. Despite this termi nology, growth of these yeasts in wort is not necessarily confined to the top or bottom regions of the fermentor. Rather, top-fermenting yeasts, as they grow in the wort, tend to form low density clumps or flocs that trap CO2 and rise to the surface. In contrast, when lager yeasts flocculate, the flocs sediment or settle to the bottom. The ability of brewing yeast to flocculate and the point during the fermentation at which flocculation occurs are very important factors, as will be discussed later. It should also be noted that the distinction between top- and bottom-fermenting yeast is beginning to be less relevant, as the use of enclosed cylindroconical fermentation vessels results in even ale yeasts dropping to the bottom of the fermentor (discussed below). Another major difference between ale and lager beer concerns the temperature at which the fermentation occurs. Ales are normally fermented at fairly high temperatures, from 18°C to as high as 27°C, well within the range at which S. cerevisiae grows. It is no coincidence, therefore, that ales were more commonly produced in warmer climates that are typical in the British Isles; hence, many of the classic English-style beers are ales. In contrast, lager style beers are fermented by yeast capable of growing at temperatures below 15°C. Not surprisingly, these beers evolved from Germany and other northern European areas, where the ambient climates were cooler. Interestingly, when German immigrants moved to the United States in the late 1800s and early 1900s, they brought with them German beer-making technology. The American beer industry subsequently became dominated by large breweries making lager beers (e.g., Schlitz,Anheuser-Busch, Coors, Miller, Stroh, Heileman, Pabst, and others). Yeast classification can be confusing for microbiologists who are often more familiar with classification systems used for bacteria. Part of the difficulty in understanding yeast taxonomy is due to the significant biological differences between prokaryotic and eukaryotic organisms. Structurally, yeasts contain a nuclear membrane, whereas this membrane, by definition, is absent in prokaryotic bacteria.Although yeasts mostly exist, like bacteria, as unicellular organisms, they can also develop mycelia and grow as multicellular organisms. The means by which yeasts replicate provides another major difference. Yeasts can divide, like bacteria, by binary fission, but they can also reproduce by sporulation or by budding. Whereas bacteria contain a single chromosome and are monoploid, yeasts, in their diploid state, contain sixteen pairs of chromosomes.Actually, as discussed in Box 9-10, most brewing yeast strains are polyploid, containing more than two chromosomal copies. Finally, in addition to genes located on the chromosome, yeasts contain mitochondrial DNA, and most strains of Sac-charomyces cerevisiae also contain multiple copies of a large, extrachromosomal element called 2 ^m DNA. Although S. cerevisiae is among the most well-studied of all organisms, the laboratory strains for which genome sequences and other biological information are known are quite different from the strains used to make beer (Table 1). 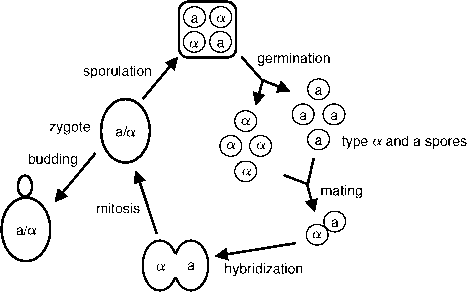 For example, the life cycle of S. cerevisiae ordinarily includes a sexual or sporulation phase, with diploid cells undergoing meiosis and leading to formation of asci-containing spores (Figure 1).The haploid spores are of opposite mating types (a and a) and can mate, forming new diploid cells (a/a). Brewing strains of Saccharomyces, in contrast, rarely sporulate, and when they do, the spores are usually not viable nor are they able to mate.Rather, strains used for brewing reproduce primarily by multilateral budding, with buds forming across the entire surface of the cell (i.e., in contrast to strictly polar budding). Table 1. Differences between lab and brewing strains of Saccharomyces1. Until relatively recently, yeast classification was based on much the same criteria used for fungal taxonomy (yeast, after all, are unicellular fungi and are grouped in the same family, Eu-mycetes). Thus, the main classification criteria were based on spore formation and the presence/absence of ascospores. However, as noted above, many yeasts (especially brewing and wine strains) do not sporulate, and classifying yeasts on this basis was not very informative. Instead, yeast classification is now based on morphology, biochemical, physiological, and genetic properties. Brewing yeasts, in contrast, share similar morphological, biochemical, and physiological properties and distinguishing between different strains is not easy (Table 2).This has not been a serious problem for brewers, who routinely classify yeast in a rather practical way as belonging to one of two species. Ale, or top-fermenting yeasts, belong to the Saccharomyces cerevisae group. Lager, or bottom-fermenting yeasts, belong to the Saccharomycespastorianus group (formerly classified as Saccharomyces carlsbergensis,then as Saccharomyces uvarum).